Saugus is a neighborhood in Santa Clarita, California. 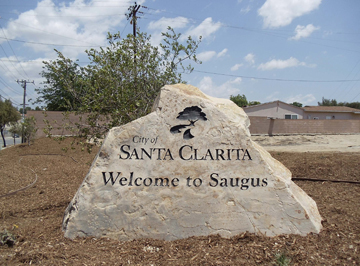 Saugus was one of four communities (along with Valencia, Newhall, and Canyon Country) that merged in 1987, to create the city of Santa Clarita. Saugus is named after the town of Saugus, Massachusetts, the hometown of Henry Newhall, upon whose land the town was originally built. The Saugus Cafe, on San Fernando Road, was established in 1887 and is among the oldest restaurants in Los Angeles County. In 2000, the total population of Saugus was 41,743, and its population density was 218 persons per square mile.